Facing trouble to retrieve data from OST File? Not able to synchronize your offline folders with Exchange Server Mailbox's Data? Need a reliable solution to recover deleted OST file ? These situations can be handle with the usage of some fastest external solution instead of using an inbuilt utility. Our Outlook OST Recover tool is packed with advanced techniques of retrieve OST file as well assist to move OST data into PST after completion of recovery operation of damaged Offline storage table files. There are many more advantages with external OST Retrieve solution like no data loss, safety of original email ingredients, ability to repair majorly corrupted OST file as well as transfer OST file to different location. It has been seen that Inbuilt utility like Scanost.exe do not liable for data security and data integrity. 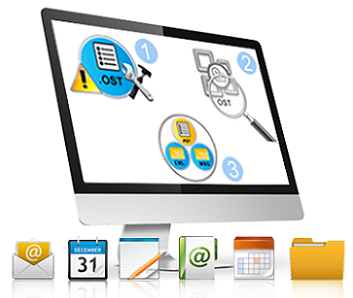 Hence, it wise to choose recovery tool for OST emails, attachments, tasks, calendars, journals etc. WHICH SOLUTION IS RESPONSIBLE FOR OUTLOOK OST RETRIEVE FREEWARE TRIAL? OST Retrive tool is the smoothest external solution to retrive damaged Offline storage files, you can try demo version of software to resolve all your queries. Do it yourself after installing free edition, it will surely cut down all your doubts and allow you to save 25 items per folder. For saving complete converted PST files, you will have to purchase license edition of this tool. Our remote services are also useful to get your inaccessible OST data files. To utilize these services, you will have to contact our support executives. They will access your system for making successful process, users can also get the services for shifting their inaccessible OST data into EML,PST or MSG format.